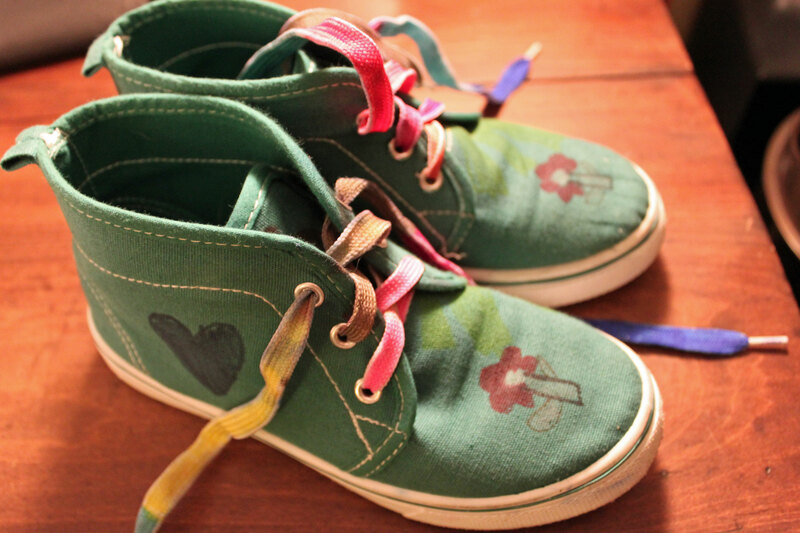 The bigger kids and I decorated canvas shoes as a school art project recently. I bought them inexpensive canvas high-tops (green, because that’s what we found cheap in their sizes), and I got white slip-ons from Amazon for myself. We decorated the shoes with Sharpie markers. I thought we might spray them with rubbing alcohol to get the fuzzy effect, but once we were done we were all too attached to our line art as it was to spray it. The kids immediately wore their shoes until the grommets fell off and one of them got a hole in the toe. 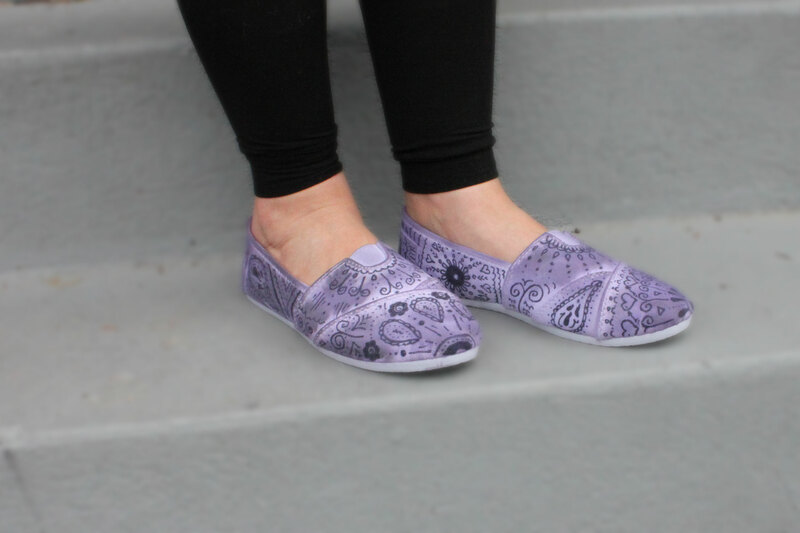 I didn’t love mine; the black pen on the white shoe just wasn’t doing it for me, and the stark contrast called too much attention to my I’m-not-an-artist pen work. 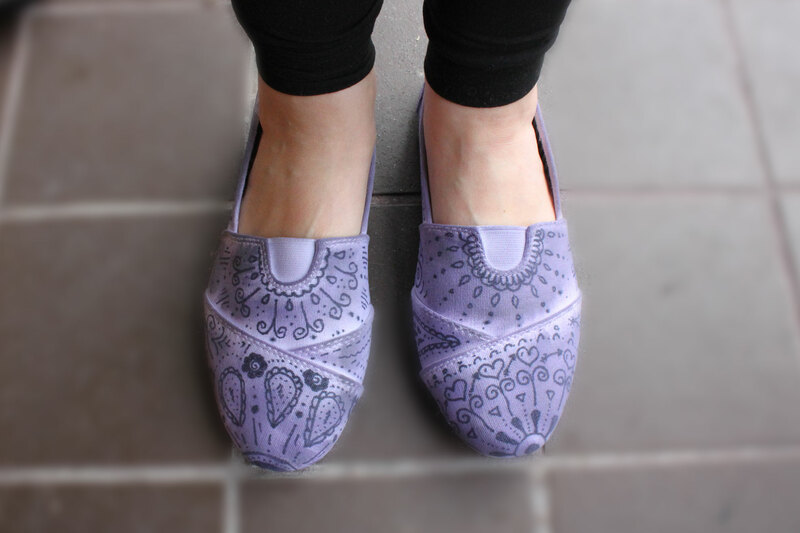 Then my daughter and her sleepover friend were decorating t-shirts with fabric paint, and I got the idea to give a similar treatment to my shoes. I watered down multi-surface craft paint, then sponged the color all over my shoes. Even watered down, the paint covered my pen drawings a little too much, so I ran the wet-paint shoes under the faucet, and then I thought they looked just right. The color kind of settled into patches like it’s supposed to look like that, and now I’m pleased. This was a fun project and the shoes fit comfortably and feel just like my Tom’s. Too cute! Love seeing all of your ideas! Can’t wait until I am a house wife (May 2015) to try all these things! I think they turned out great! What a fun project to do with kids!